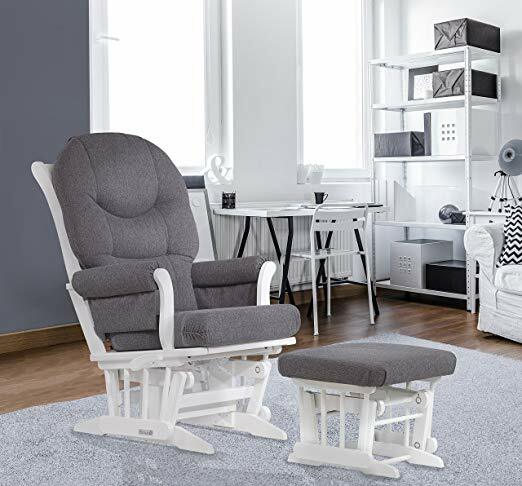 We’ve updated our guide for Dutailier Glider Review for nursery with new models and research. Dutailier has an incredible selection of over 90 models, seven finishes, and 80 different fabrics which makes it quite a daunting task to choose the one that will fit your need. We researched 35 glider chairs and shorted it down to ten before bringing in some expertise in the form of real-life parents experiences to finalize the best Dutailier gliders for different needs. For those long nights positioned in the nursery soothing your baby or getting the little angel back to sleep, you’ll definitely want a place to sit that’s not only comfortable, but supportive and easy to get up without waking up your baby. Considering all the evaluating factors (discussed later) , in the end, the Dutailier Modern Glider Multiposition Recline and Ottoman Espresso won out as the best dutailier glider around. Enough space for parents of all sizes. Can recline up to 18 degrees , plus you can lock the it into six different positions. Well padded arm rest cushion for comfort. Easy to get in and out of the chair. Does not have reclining functionality or multi position lock option. Does not come with ottoman. Hardwood frame with espresso finish. Removable foam cushions and padded arms. 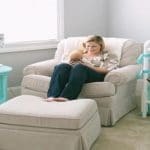 Several features stacked up to declare the Dutailier Modern Grande Platinum Glider and Ottoman Combo our top pick for the best dutailier glider for nursery. Comfort : With a seat of 26 inches width by 31 inches depth, and a back support that is 43 inches tall, the chair have ample room for parents of many different sizes. Also adding to the comfort factor, the glider and ottoman cushions are both amply padded and upholstered in a fantastic microfiber fabric. Performance : This glider can actually recline up to 18 degrees , plus you can lock the it into six different positions and it can still glide while reclined! These features might not seem like a big deal at first glance, but the multi-position locking options and the recline capability can make a whole lot of difference in your experience while settling with baby for long hours. If you want to read, watch some TV, or nap, the positional changes can make you much more comfortable. In fact, anything you want to do while holding your baby, you can lock this glider into the best suitable position for you. Ease of Use : The multi-position lock feature also caters to our other test criteria of making sure the chair is easy to get in and out while holding the baby. The handle on the lower right locks the glider in place while the handle on the lower left controls the recline . You can lock the glider in a vertical position making it a stable base for sitting down and standing up. We recommend this dutailier glider chair as the best value because it comes for $100 -$150 less but has almost all the useful features as in our top pick. Comfort : The seat is 27 inches width by 21 inches depth and back support high enough for 6’2” tall parent. A well padded (3 inches thick) glider, is comfortable enough to spend long hours sitting in it nursing or putting your baby to sleep. Performance: You can recline it in three positions and lock it in there. Also once reclined and locked, it can still glide with ease. Ease of Use: Multi position reclining and lock feature makes it easy to get out of the chair , but some parents have complained about the hand rest. Quality and Safety : It is made up of hardwood frames and 100 % polyester is used for the cushions – making it easy to maintain and care for. The white finish hardwood lends an elegant look to most rooms. The ottoman does not lock so you have to be careful there. Over all it is a quality product to have in your house. The set comes preassembled and the final assembly can be done in a jiffy – and without any complex instructions. Parents everywhere loved the chair and it paid back for its price with service over the first few weeks after the baby came! And as opposed to other sellers, Amazon ships this to you for free – more reason to order it here than elsewhere. Comfort : Our test found It is narrower than our top recommendations above. The seat cushion is soft but supportive and the back support is quite comfortable and a parent of 5’10” can rest her head on the top of it easily. Couple of testers complained about it’s velcro arm covers which were found to pull apart with the lightest of touches raising the possibility of the sound waking up the baby. But this issue can be solved by stitching them together. Performance: It has no reclining function but was found quite comfortable and stable while rocking freely. It is made up of microfiber fabric instead of polyester, making it easy to clean! Also the foam from the cushion and arm rests can be removed for cleaning. Ease of Use: The Comfortable cushions, no squeaky noises from the chair a good choice within budget. It has been tested with adult of around 5’10” and it was comfortable enough to fit in or get up . But while testing with larger sized adults it was found to be a little narrow and it became tighter and uncomfortable for them to get off the chair while holding baby in hand. Quality and Safety: The wood frame is beautiful with espresso finish , so no uneven edges and the cushions were found to be soft and of nice quality. The chair also gave a sturdy feel and is simple to put together and assemble (with just 4 screws). It is actually a great deal when you consider that it costs just over half of what the other two cost. So if you are indeed considering this, check out the reviews and then get set to order! In our test group we had couple of parents who were expecting twins. As most gliders and rockers are actually designed with single kid and one adult in mind we had to research for options that would fit these parent’s requirement.. Also , there were few parents who wanted a chair that would accommodate a baby and a toddler. Two parents from test group wanted a chair for two people to sit down beside one another. In our research we did not find any Dutailier Glider suitable for mom of twins. We finally narrowed down to the Dorel Asia Double Rocker as the best nursery chair for twins and for siblings. The seating area is 33 inch wide with plenty of space for both parents to sit comfortably with twin babies in hand. We also tested this rocker out with a five year old next to an adult, and there was enough room for him to sit up or to lay down for story time. In addition to the larger capacity, it’s easy to clean with microfiber fabrics, and it costs half as much as two other options we found. It was the easiest to set into motion, a crucial feature with a chair of this size. There was one complaint from our tester that it didn’t rock as much as a normal rocker or glider. But according to most, though having the exceptionally wide and heavy base it is a little harder to rock, but it serves the purpose well providing enough room for both parents to sit with the twins or for mom with elder sibling besides the new baby. How We tested and analyzed the nursery gliders ? Comfort : A glider that is a nice fit for you will differ from what has worked for your friends and relatives. While looking for a glider you should consider your size, especially your height. Several gliders that we analysed had short back that our testers felt lacked the proper support for the head, back, and neck. You’ll also want to test out the armrests because it is crucial that it can support your elbow comfortably while holding the baby for hours. Performance : A good glider should move or glide smoothly without squeaking, relaxing you and your baby . It should also have firm, supportive cushions to help prop you up when holding your baby. Ease of Use: It is of utmost importance that the glider provides a stable back support and locked in position while you get in and out of it comfortably and with ease while holding the baby in your hand taking care not to wake him up. A varied range of fabric choices and colors , Multiple wood color options,Different configurations (e.g. glide, multiple positions, or reclining). While some companies advertise hundreds of fabrics, you’ll be able to eliminate at least 75% of them at first glance because of some atrocious color combination. You can also order swatches from manufacturers if you’d like to see the color in your nursery space. 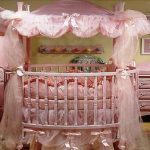 Another important thing to consider is your space specially when you consider the crib, the dresser, and everything else that goes into the modern nursery. 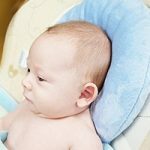 What is the best time to buy nursery glider? It can take ten to twelve weeks to order a custom Dutailier rocker (more for leather options), but the company does offer a “Quick Ship” program—a selection of around 15 to 20 chair styles in two or three different fabric choices that are in stock for shipment in two weeks. There are occasional complaints about how long it takes to order a Dutailier from a chain store, only to find out some weeks later that the fabric was discontinued (Dutailier “forgot” to tell the store). Our advice: Buy it from Amazon for speedy delivery and avoid unnecessary hassles and delay . If you are a prime member specially it will be delivered in 2-3 days maximum. Some Other Glider Options that we found but did not make it to the top recommendations. • Dutailier Minho — Though highly rated this dutailier glider with high back rest, recliner and 360 swivel, did not make to the top list because of lack of wiggle space for bigger size adults in spite of being expensive. If you are of average size this can be a good choice for more luxurious comfort. * Dutailier Lungo – Have high back seat , but couldn’t reach our top recommendation given the lack of recliner function even though expensive. • StorkCraft Hoop Glider—Though inexpensive there are 289 1-star reviews on Amazon that tore this chair apart. The complaints include: Poor quality wood and fabrics, chairs falling apart, no one answering the customer service lines and missing part. It’s easy to underestimate the value of a glider. 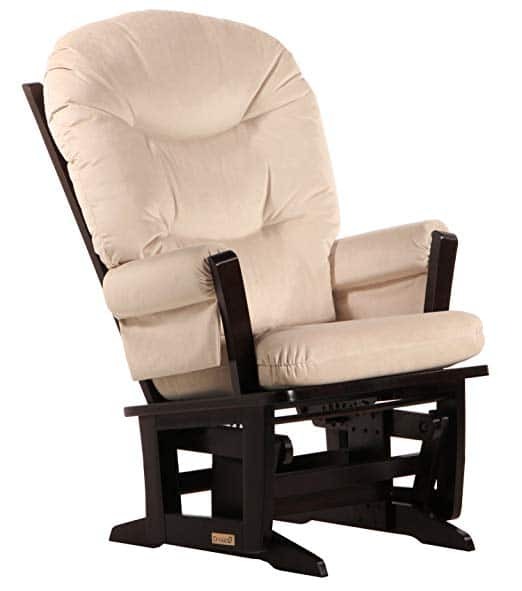 You might think you already own chairs but a glider can make a huge difference in your nursery. What sets a glider apart from a normal chair is that it has higher arms to support the weight of a baby and a restful gliding motion to soothe both you and the baby when it’s needed. Both of those features are crucial for your comfort as well as baby’s for long nursery nights. Our top recommendation Dutailier Modern Grande Platinum Glider is comfortable for a wide range of parents, is easy to get into and out of, and looks great to boot. The next best value option is Dutailier Modern Sleigh Glider. 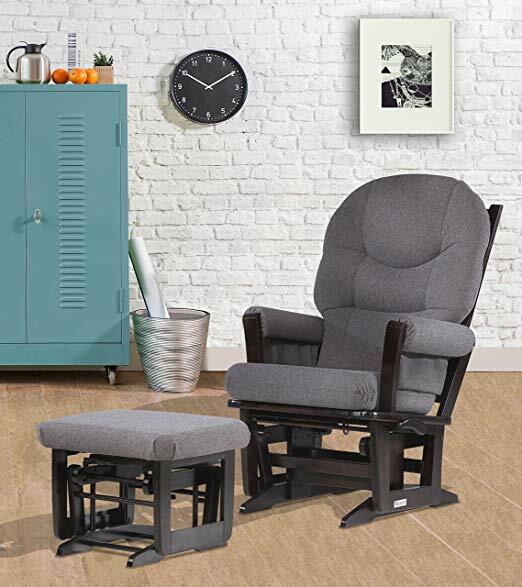 If you are on a tight budget go for Dutailier Round Back Cushion Modern Glider and if you are expecting twins or have an elder sibling of the new baby to attend to Dorel Asia Double Rocker is your best option.